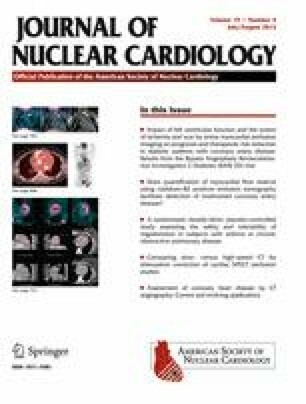 Comparative assessment of rest and post-stress left ventricular volumes and left ventricular ejection fraction on gated myocardial perfusion imaging (MPI) and echocardiography in patients with transient ischaemic dilation on adenosine MPI: Myocardial stunning or subendocardial hypoperfusion? Transient ischaemic dilation (TID) on myocardial perfusion imaging (MPI) is an important finding, conveying a high risk of subsequent cardiac events. However, the mechanism leading to TID on MPI is not well elucidated. This study aimed to determine if TID is due to true LV cavity dilation and ventricular stunning, or is due to relative subendocardial hypoperfusion. 31 patients undergoing single-day Tc-99m adenosine sestamibi MPI were recruited. All had routine ECG-gated single-day rest-stress adenosine MPI, with transthoracic echocardiograms (echo) acquired concurrently at rest, and both immediately, and 2 hours, post-stress. Echocardiography was performed using a Vivid-7 (GE). LV volumes and LVEF were quantified blinded to MPI results, using biplane Simpson method on echo, and quantitatively (including TID) with QGS®, on MPI. Patients were divided into quartiles for TID, with the top quartile considered TID positive [TID+ 9/31 (TID ratio 1.3 ± 0.09)], and TID negative [TID− 22/31 (TID ratio 1.01 ± 0.04)]. There was good correlation between resting echo and MPI physical measurements (LVEDV r 2 = 0.79, LVESV r 2 = 0.9, and LVEF r 2 = 0.75). On MPI, a significant drop in LVEF was observed between rest and early stress in the TID+ group (56.6% vs 46.5%, P < .002), as well as an increase in both LVESV (62 vs 79 mls, P < .0001) and LVEDV (113 vs 131 mls, P < .0001). However, no statistically significant change in LVEF, LVESV or LVEDV was identified on concurrent echo imaging (LVEF 57% vs 56%, P < .66; LVESV 48 vs 54 mls, P < .26; LVEDV 87 vs 97 mls, P < .299). No significant change in LVEF or ventricular volumes was noted in the TID− group by either echo or MPI. Transient dilation of the left ventricle on adenosine MPI is not related to chamber enlargement and myocardial stunning, but is more likely a function of subendocardial hypoperfusion and impaired coronary flow reserve.